This is Part IIIa of a series on training for legal translators. See the first post here. This post looks at looks at how to get better by having a document focus. Following posts on how to get better will talk about practising and getting feedback and finding a deeper specialisation. To translate well, you need to know what the document you’re translating usually looks like in the target language. This is especially true in legal translation where the structure and style of documents can vary widely from one system to another. So you need to base your study around document types. Obvious, you might say. After all, the law is a written thing. But if you were going to be a total autodidact, you could teach yourself legal translation by studying the law in a vacuum. You’d learn how the law works. You’d learn what terms mean. But your translations would sound more foreign than if you’d based your study around documents or at least looked at some documents in your target language. So you need to become familiar with target examples of typical legal documents like contracts, claim forms, judgments, articles of association and wills. You can do this systematically — as part of a study programme — or as the documents come up in your work. Systematic study is more effective. Particularly for documents that differ greatly from one system to another. Researching on-the-fly is not conducive to delving deep enough to mine all the gems that could be useful. Court documents are possibly the trickiest. They differ so much from one system to another, and you won’t find many resources on how they should be written, as you can for say contracts or legislation. So you need to draw conclusions from examples you find in English. But you’ll always be bridging gaps of non-equivalence. Although it’s also true that for document types where the rift of non-equivalence is wider, you do have more freedom. I.e., you don’t need to hold yourself so tightly to target models. You still need to get the language right, though. In some ways, having a document focus goes back to knowing what you should ignore from a translator’s point of view. As mentioned in the previous post, you can often ignore the intricacies of your target system, you simply don’t need to know them. Take contracts, for instance. 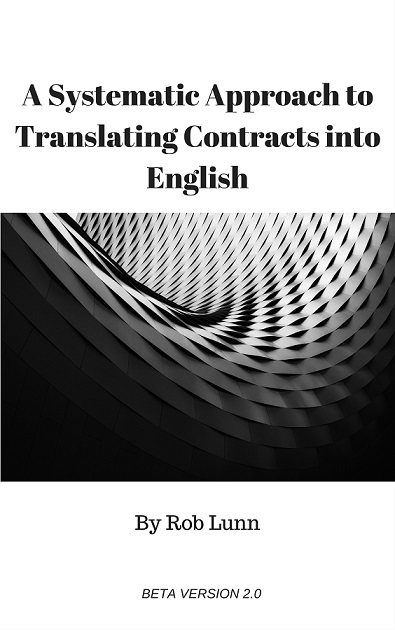 There are whole areas of contract law you don’t need to know about to translate a contract. What matters is the language used in contracts — headings, legalese, style, conventions and terms found in contract subtypes (e.g., supply, agency or loan agreements). It’s useful to know how a contract is formed in your target system, but you don’t need to know this — or at least remember all the details — to translate a contract. Thus, base your learning around the kind of documents you expect to translate. Of course, also learn about the law. But once you get past the basics (talked about in Part II), be fussy about what you learn. Make sure it’s going to help you translate better or serve some related purpose. At least until you get to know the documents you translate well and know exactly the kind of language you should be using in your translations of them. After that you can go deeper in other directions. Posts related to Training for legal translators. Part IIIa. How to get better.